HTC is set to launch its all new One smartphone on Tuesday of this week, but there’s still time for one final rumor. The good news is that the phone might be available on store shelves shortly after the announcement. The bad news (for some) is that it might launch first as a Verizon(s vz) exclusive. 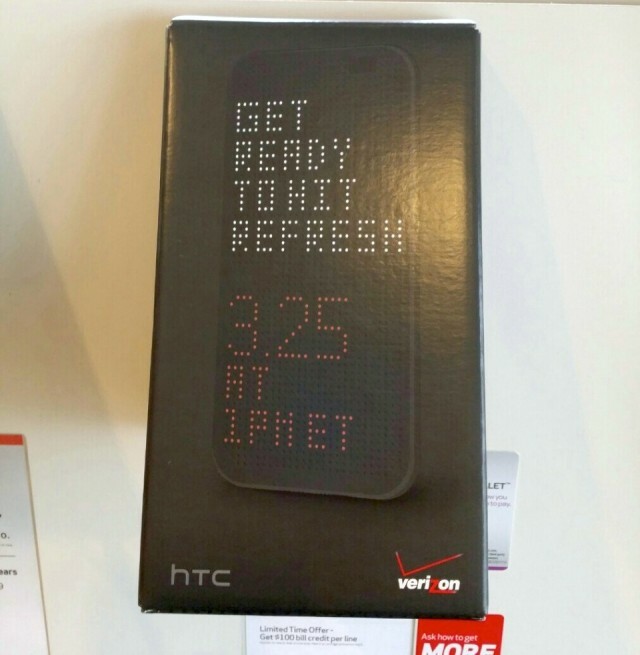 This idea first surfaced last week, when leaked marketing materials from Verizon stores showed an HTC One promo box with the text “Get ready to hit refresh” and the date “3.25 at 1PM ET.” That certainly sounds like a release date and time, as HTC is scheduled to announce the phone tomorrow morning at 11AM ET. That would give Verizon just enough time to get everything in place. And HTCSource is reporting that not only will Verizon be offering the phone tomorrow, but it will be the only carrier to offer it for the first two weeks. According to its source, Verizon will be the selling the phone “exclusively for a couple of weeks.” After that, the device is believed to be launching in 110 global markets. If this turns out to be true, I’m sure Verizon paid a pretty penny for a first crack at the device. But with the Samsung Galaxy S5 right around the corner, I wonder if it would help HTC more to make the device more widely available as soon as possible, in order to capitalize on any impatient Samsung customers. Either way, I’ll be at HTC’s event in New York City tomorrow, so we’ll know soon enough. If true that is a major mistake by HTC. They need as many outlets hawking their new phone as soon as possible. The Galaxy S5 will be launched with a huge marketing blitz and HTC can ill afford to be shoved a side again. Do they really expect 2 weeks to drive new customers? Has their opinion of the American consumer dropped so low that they think this will be a big factor? I really hope that VZW did not pay a pretty penny for just 2 weeks of exclusivity.